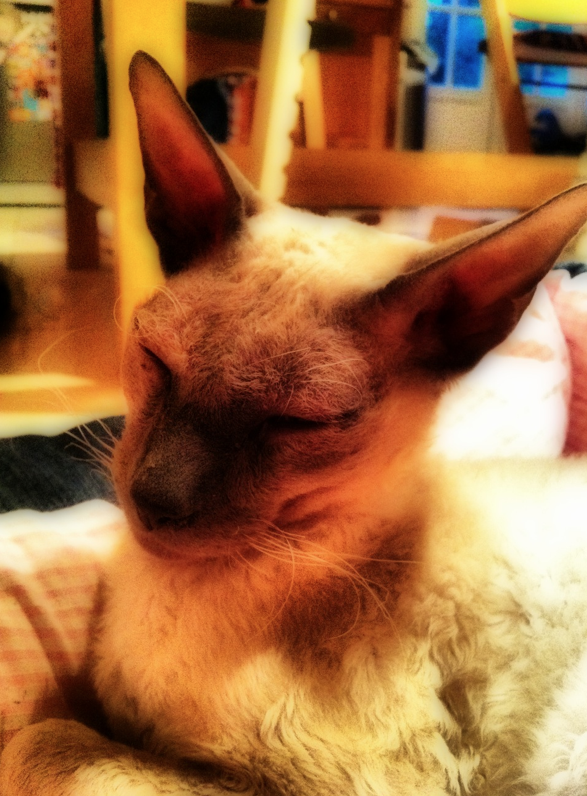 My beautiful Cornish Rex cat, Rex was killed a couple of weeks ago in a hit and run. We miss him so much and as the days go by it doesn't ease. Biba (10), found him on the road outside our house. It had just happened. He was still alive but barely. He was bleeding out of his ears and he'd lost most of his teeth in the impact. The driver thought it was ok to just keep on going. My Gallery pic this week is in memory of my little Rex with his fat saggy belly and his love of food, Sonny and me. He was more of a dog than cat in nature, loving to come on walks with us and insisting on accompanying Sonny to the school bus in the morning. He was a softie, a cutie and will always be missed. For this weeks The Gallery. Do stop by the other posts you will find on the linky on Tara's blog. Huge hugs. Still remember losing two cats in hit and run accidents when I was about 15. Special hugs for Biba, must have been horrid. Gosh that is so sad. RIP Rex, he sounds like he was a lovely pet. Beautiful photo. You must miss him... This is some kind of small memorial, and a way to share your loss. Condolences... but it is a wonderful picture: full of atmosphere, and I'm sure, when you see it now, memory. Oh, that's so sad. He was a beautiful cat. I love siamese cats, they are more like people than cats really, always talking away. I hope it gets easier to live life without him as time goes by. I am so sorry for your loss and to hear that somebody thinks it is ok to run from this! This is a very beautiful photo and tribute! oh my god - that is horrific! I really don't know what I'd do if that happened to me... My uncle (about a year ago) was walking his little Jack Russells and he'd only got to the end of his drive way and one slipped its lead - ran straight into the road, which is a really busy road and she was squashed before his eyes. He was devastated and its evident everytime I see him. She was called sugar and she was my little Rambo's sister :( so she would of have been 6 this year. Its horrible. I know that our pets wont be around forever, but when they are taken too soon, its just not fair.